Performance 2.0 Steel Garage Cabinet Set (6-Piece) in Black with Bamboo Top Get all those cables, decorations and gardening tools off your garage floor and into NewAge' newly redesigned, Performance 2.0 Series modular garage cabinetry. These cabinets are built to last with their fully welded, 24-Gauge steel frames and fully lockable, double walled doors. Our configured sets are shipped with adjustable steel shelving; easy-to-grab stainless steel handles and height adjustable levelling legs that accommodate uneven garage flooring. The manufacturer's limited lifetime warranty gives you the insurance that your cabinets will look great for years. 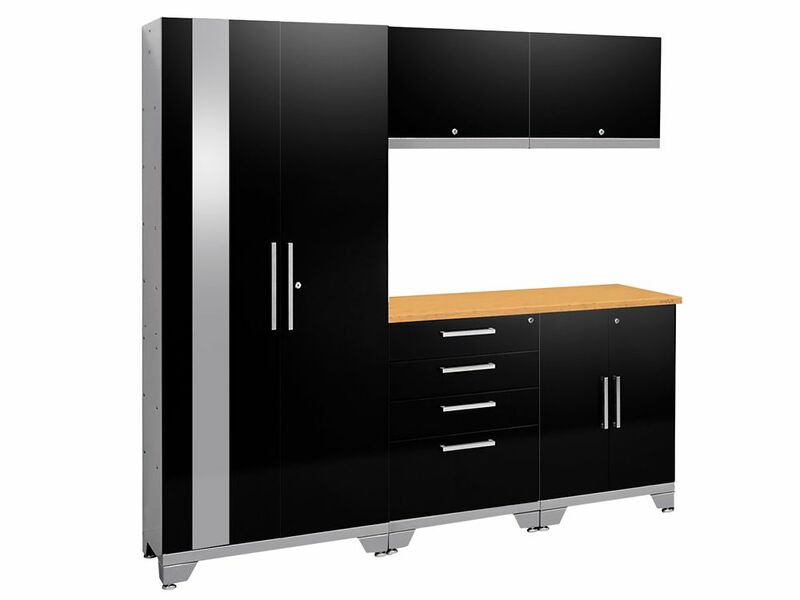 Performance 2.0 Steel Garage Cabinet Set (6-Piece) in Black with Bamboo Top is rated 4.5 out of 5 by 6. Rated 4 out of 5 by Babs from UP GRADE Have taken our garage from disorganized , too a garage your not embarrassed about if you leave the door up. Worth the money . Easy to install. Rated 5 out of 5 by Lyle306 from Impressive quality and packaging Bought 2 of these sets a couple weeks - just received and unpacked. I was very impressed with how well New Age packages these products for shipping - no damage. Great quality: strong, nice finish, good drawer hardware, and no slip mat at the bottom of each drawer. Compared this to other products available in store at the major home improvement box stores and the quality and appearance of the New Age Products cabinets is far better.